The pastor walked onto the platform carrying a guitar case. The subject was treasure and it was refreshing to hear him say “These are some things I love”. Now, we knew what he meant by “love”. I’m pretty familiar with this guy and count him as a friend and I’m certain that the word, in this context, wouldn’t compete – wouldn’t even be considered in the same category as, say, people he loves. I know some of those people, too. They are truly loved. That’s a whole different story. But on this day, we got to see inside – to catch a glimpse of some small material things that were the objects of the sermon and dear to the heart of this man. I said it was refreshing to hear him say “I love these things” because too many pastors or others caught in the spiritual spotlight would be way too pious or cautious or insecure to actually admit love for things. He began by pulling out a twelve string acoustic guitar. I recognized it because I had one sort of like it a long, long time ago. It was an Ovation guitar and one of the first public sightings of Ovations was on the Glenn Campbell TV show back in the 70s. Ovation guitars were unique. Made from some high tech composite, the back was bowl-shaped and virtually indestructible. At the time, I think I remember them saying the bowl was made from the same material as helicopter blades – and they sounded pretty good. I actually owned two or three of them. One was stolen from the airport in Baton Rouge, LA . . . don’t remember the year. I just remember having it one minute and not having it the next. Another showed up at baggage claim with the headstock (the part where the tuning keys are) dangling precariously . . . held on by the strings. Another was a nylon string version that was pretty cool. It was as close as it got to me becoming a classical guitarist. Over the years, they were replaced. I don’t know if a guitar player can ever justify another guitar . . . but we just think every one (or every different one) has a new song or two in it so why not? The pastor’s guitar was a gift from his wife. She knew how much he “loved” them and presented this beauty to him one Christmas or birthday or some special occasion. It was one of his treasures. He to dug around in the guitar case some more and pulled out a watch that his wife had given him for a wedding present. It was nothing particularly fancy but it was still working and it was valuable in a sentimental sort of way. He pulled out a car key and declared, “Every man, at some time or other, wants to own a Porsche”. I can’t say I’ve ever wanted one but don’t want to spoil a good story so I’ll go along. OK. He told us about being a young businessman, newly married and one day passing the sports car of his dreams sitting on a lot for sale at what seemed a very fair price. Lured into the purchase, he found out what so many of us have discovered about so many things. They say the best two days of a boat owner’s life are (1) the day he buys it and (2) the day he sells. That wasn’t particularly true with my boat owning experience, but again, I don’t want to spoil a good story so . . . OK! Apparently, the dream car cost more to repair and maintain that it was worth and that led to the happy day when he was rid of it. He still had the key, though, as a reminder. He did say he thought it would be fun to look up the current owner – providing it had yet to be made into a steel pancake – and maybe take a peek at it . . . and maybe take the beloved key and move it from one parking space to another. This is a mischievous pastor-type guy. He showed us more treasure. A book his father had written . . . a tie that belonged to his late father-in-law. While my years of exposure to God’s Word, the instruction for living a Godly life, and the sometimes feeble efforts I make to that end are always on my heart and mind, there are some things I still hold to have some value. A few things I can hold in my hand. I think the key to being able to enjoy whatever the perceived value might be in these material goods is to always be aware of how quickly they can disappear. 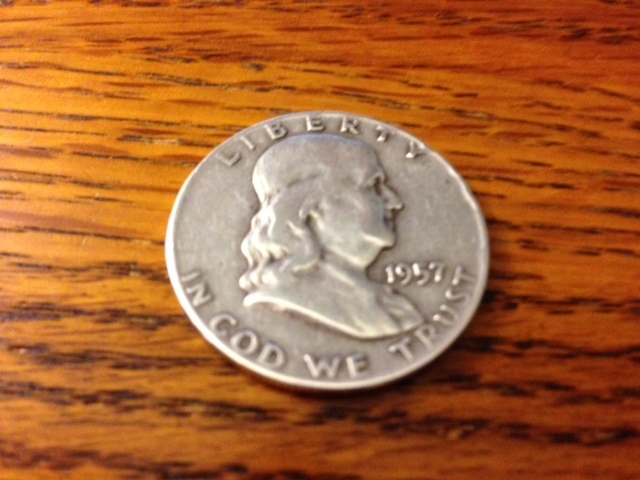 I carry a fifty-cent piece in my pocket almost every day. Sometimes I use it to mark my golf ball when I play (If I mark it “heads up” and make the putt, it’s “heads up” for the rest of the round). I think I’d have to be pretty desperate, starving or dying of thirst before I’d spend it. It’s a 1957 Benjamin Franklin half-dollar – Benny’s head on one side and the Liberty Bell on the other. Any serious coin collector would probably tell you it’s not worth much but I like it. I like reaching in my pocket through the day, grabbing for other change (what’s the deal with pennies and how long are we going to play this game??? ) and knowing it’s there. I think good thoughts about my dad every time. I loved him and still miss him. Dad gave me several coins like this. 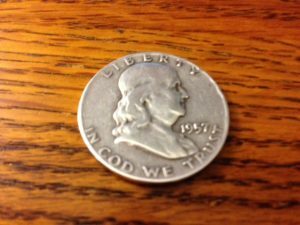 I carried one and lost it somewhere – a 1939 Liberty Walking half-dollar. It was my favorite one that dad gave me and I hope it will turn up someday, but like I said, stuff has a way of just vanishing sometimes. I’ve looked on ebay and could buy another pretty much just like it – and I might do that – but it wouldn’t be the same. 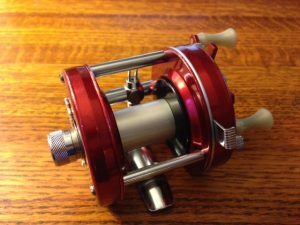 I have an Abu Garcia Ambassadeur 5000 (yeah, the spelling is Swedish) fishing reel that was made in the late sixties. 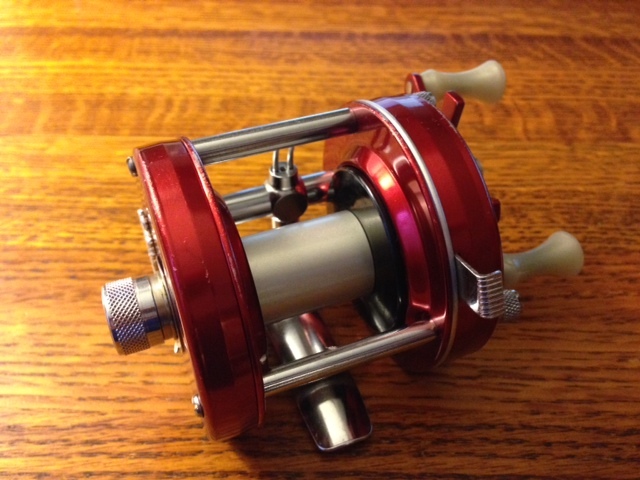 It’s a beautiful ruby red and it was the first nice piece of fishing gear I ever bought. I saved up my money from mowing lawns to buy it and used it all the time. The one that sits in my bookcase is not my original. That one, too, got put aside in a move or is somewhere in a box in an undisclosed location. Maybe that will turn up again someday, too. I found the one I have now on ebay. Whenever I catch it out of the corner of my eye, I think about some of the good days of fishing in the warm summer sun when I was a kid. Just now, I sat still for a moment and looked around the room then, got up and looked around the house. Found a few more things. But I had to think about it for a minute. 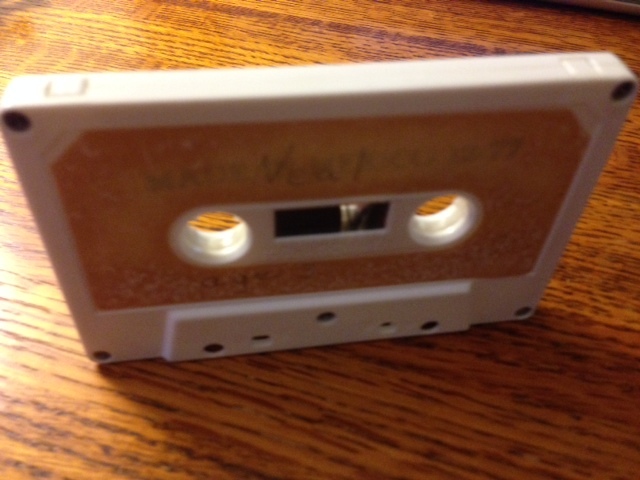 There is a cassette tape in my desk drawer. On it is a conversation between my first born, Neal (age 3) and his mom. I haven’t listened to it in years and honestly, I’m a little apprehensive to play it. First off, I don’t have a cassette player anymore so that’s a problem and second, I think if I did play it, it might be the last time as the tape would probably vaporize and fly away. 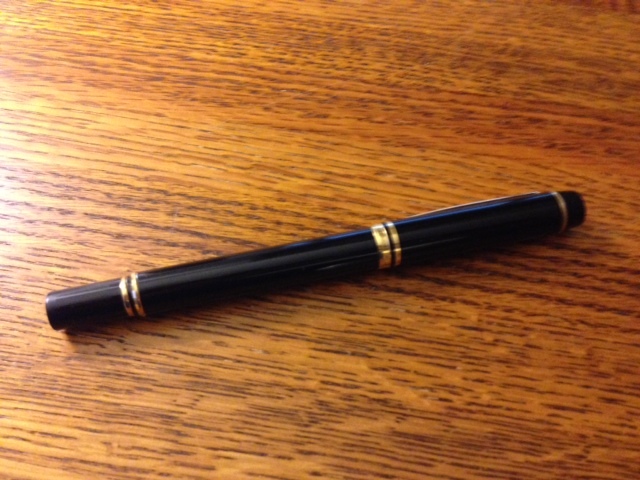 There is a pen that I still use every day that my friend, Tim, gave me a long time ago. We were very close – like brothers. Still one of the best people I know. Time, circumstances, geography keep us from getting together like we used to. But we still talk from time to time and I’ll always count him as one of my true friends. 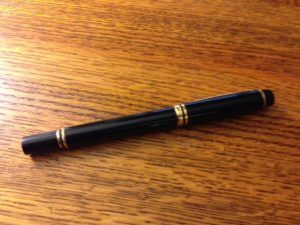 My name is etched into the side of the pen along with a scripture reference – Proverbs 17:17. But as I looked around the house a little more, there aren’t that many things that are that valuable anymore. I think that’s OK. I have a few good friends. Lots of acquaintances but a few friends that would, literally, drop everything right now . . . no questions asked. How can I measure the value of those people compared to a coin or a cassette tape? My wife is a treasure. In the hands of God, she has saved me from a life of “me” and given me more life than I could ever tell you. As time passes, the hold on things grows weaker and for that, I’m truly thankful. Still, given that we’re still made of skin and bone, we’ll grab some shiny lure (fishing term . . . appropriate, don’t you think?) that we just have to have. And more often than not, before the figurative “car is off the lot” buyer’s remorse sets in and the eyes start looking for something new. Sigh. So this Thanksgiving 2013, I’m just as grateful for “what is not” as I am for “what is”.